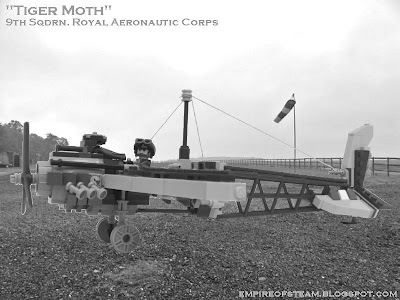 In an age of massive steel and iron airships, held aloft through the gravity-defying properties of Cavorite, the Royal Aeronautic Corps' "Tiger Moth" was an anachronistic throwback to the earlier days of aviation. Sparingly constructed, predominantly from wood and canvas, the Tiger Moth was incredibly light. This allowed it to gain very high altitude (the effective ceiling of the aircraft was limited by pilot endurance rather than technical factors), able to attack even the highest-operating airships from above, dropping liquid-explosive incendiary bombs into the gas envelopes in a crippling blow. Hugely successful in this specialised role, the Tiger Moth aircraft was to operate for many years as a mainstay of the Corps' defence strategies for the home islands of the Empire. Further images of the Tiger Moth may be viewed here.